I went a little bit strawberry crazy over the month of June. The strawberries were just so vibrant and juicy and packed with real strawberry flavor I couldn’t help myself. So consider this the third recipe in the “These strawberries are so awesome I can’t stop eating them” series. These lovely little cupcakes were made to take to a goodbye party for some of my husband’s coworkers. Since I didn’t know the people I was baking for, I tried to come up with something that was both seasonal and would have almost universal appeal. Like vanilla. Pretty much everyone loves vanilla. And the seasonal part? The beautiful farm fresh strawberries I had in my fridge. This was only my second or third time making swiss meringue buttercream, but I was excited to combine it’s silky smooth texture with the bright strawberry flavor and oh, I’m so glad I did. These cupcakes turned out like pillowy soft bites of summer. 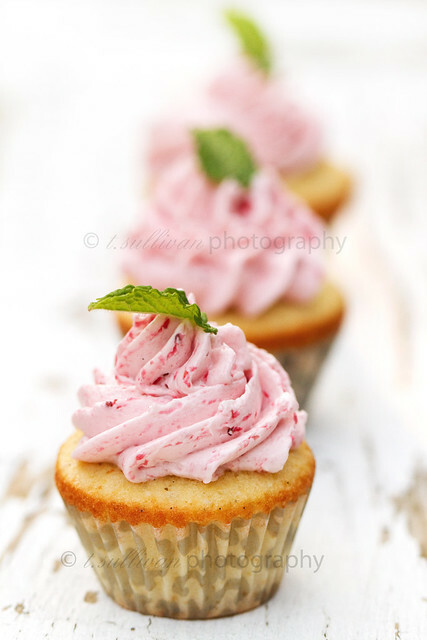 Using the vanilla bean gave the cupcakes an almost exotic flavor, while acting as a perfect canvas to highlight the strawberries in the frosting. They were a big hit! Though I have to be honest, I was a little disappointed that out of the 36 I sent to work with my husband, only 4 came back. I could have easily eaten them all myself. You can see my cupcakes were a tad overfilled so for picture perfect cupcakes, try not to fill the cups more than 3/4 full at most. Preheat oven to 350°F. Line two mini cupcake tins with paper liners. Pour milk into a small saucepan. Split vanilla bean open and scrape out seeds. Add vanilla bean seeds and bean pod to milk and heat over medium heat for just a few minutes, until milk is warm. Do not boil. Remove from heat and set aside to steep. In the bowl of an electric mixer, beat butter and sugar on medium speed until light and fluffy, about 3-5 minutes. Add eggs one at a time, fully incorporating each egg before adding the next. Remove the vanilla bean pod from the milk. Set the mixer on low speed and add the dry ingredients alternating with the milk mixture in three batches. Stop mixer when batter is just shy of combined and finish the mixing by hand with a spatula. Measure out 3/4 tablespoon of batter into each cup of the prepared muffin tins. Bake at 350° for 12-15 minutes or until a toothpick in the center comes out clean. Cool in pan for 2 minutes, then remove to wire racks to cool completely. Puree strawberries in a food processor until smooth. Set aside. Fill medium saucepan with about an inch of water and bring to a simmer. Add egg whites and sugar to the metal bowl of a stand mixer (or a large heatproof bowl). Set bowl over simmering water and whisk constantly until sugar has dissolved (about 140°F on an instant read thermometer). Remove from heat. Attach bowl to stand mixer and using the whisk attachment, beat on medium-high speed until egg mixture is a glossy white meringue with stiff peaks and the bowl no longer feels warm (about 10 minutes). Switch to the paddle attachment. Beating on medium-low speed, add butter one piece at a time, letting each piece incorporate before adding the next. Once all butter is incorporated, scrape down sides of the bowl with a spatula. Add strawberry puree and vanilla, and continue beating until frosting is smooth again. Pipe frosting onto cooled cupcakes (I used a giant star tip) and garnish with fresh mint leaves. Theresa, these look fantastic! I love vanilla and strawberry together. I have to make these soon! There is never really any such thing as having too many strawberry recipes around! I love the sound of strawberry combined with the vanilla bean…I can see why so few came back! Oh…my…goodness….That buttercream especially makes it look so amazing. Can you please come over and do a baking weekend with me? Hahahah. These are adorable. I love the swirliness of the frosting. Came over from FG to say these caught my eye! Ohhhh yumyum! The frosting definitely drew me in; just how pretty are those swirls! I definitely want to attempt these, they look delicious. Your photography is absolutely stunning! The cupcakes are absolutely gorgeous cupcakes! They look so tasty and yummy. I hope mine turn out as good as yours when I get around to making them. Great cupcake recipe! !